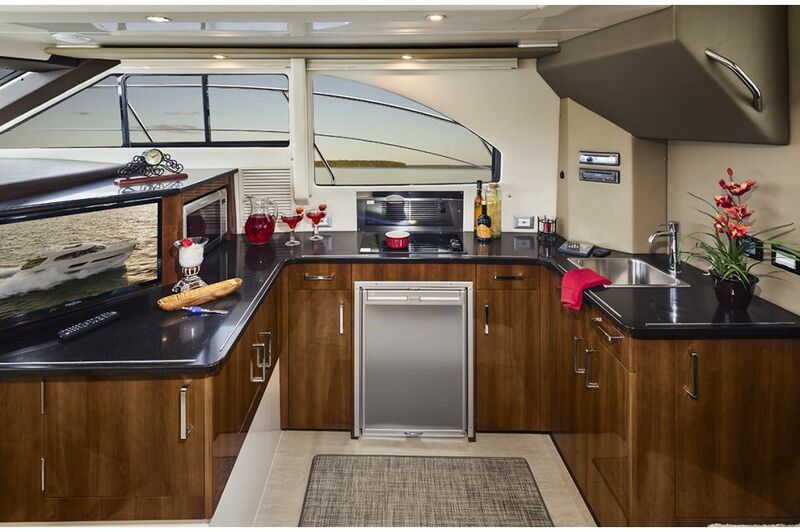 The three-deck, two-stateroom C36 Command Bridge offers real versatility, from her outstanding maneuverability and handling to her elegant living spaces. 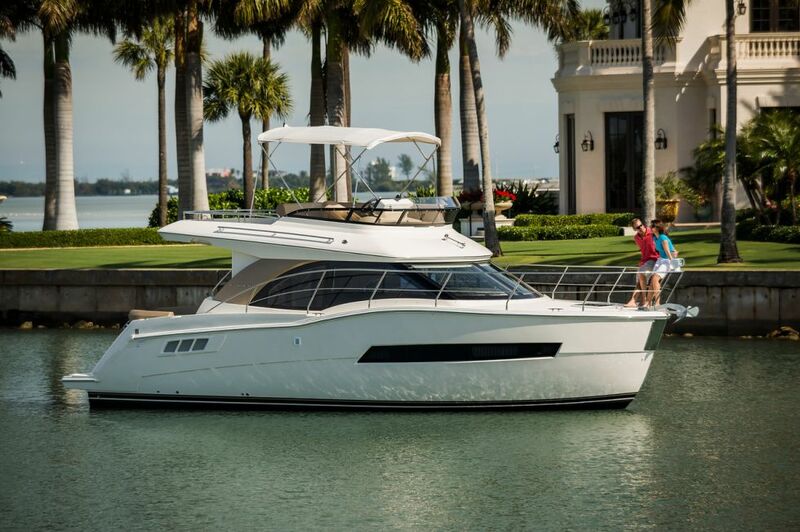 Right away, you'll notice the aggressive, raised sheer and the hull's bold shape. 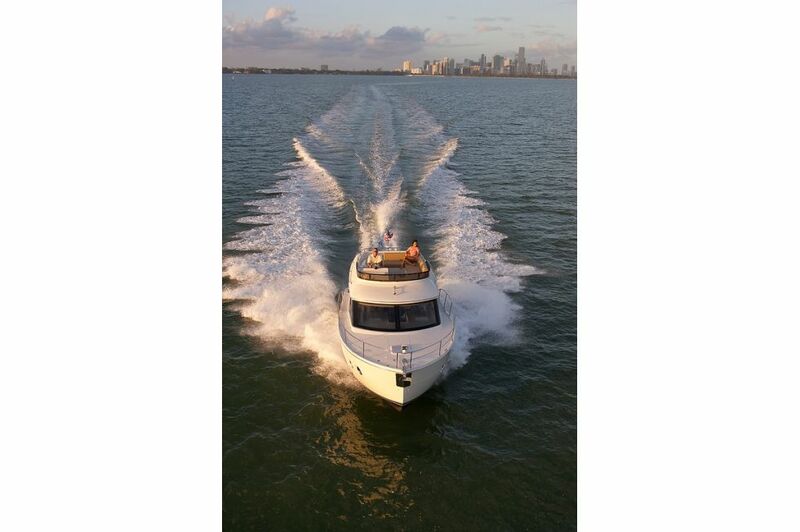 This innovative design provides an exceptionally smooth, dry, stable ride, while the twin inboard engines ensure that the C36 will be a top performer with quiet, gentle manners at all speeds. 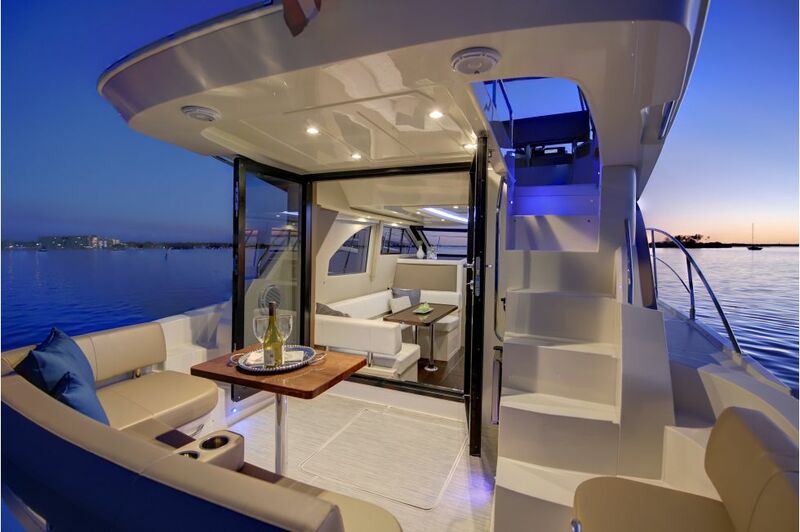 The command bridge offers unbroken 360-degree views, and the extra-wide cockpit doors and side decks provide easy access to all areas of the yacht. 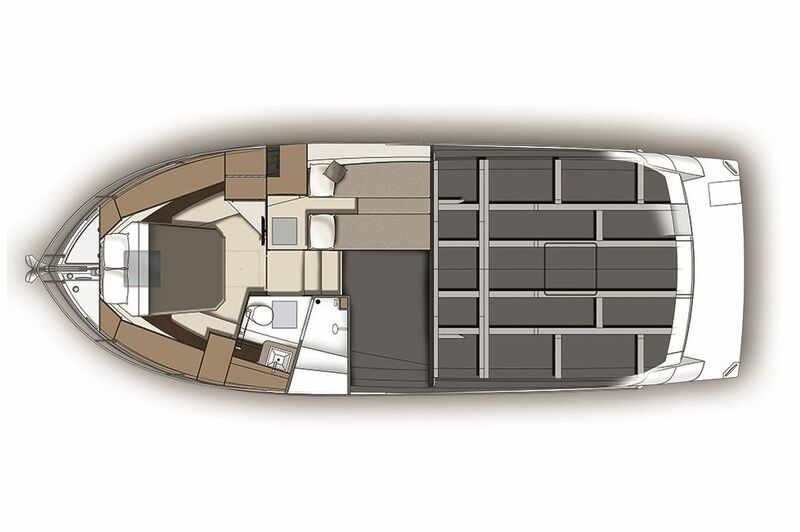 Then there are the wide-open living spaces, the generous cockpit, the integrated swim platform, and the many thoughtful amenities that make the gemlike C36 feel like a much larger yacht. That's the magic of the C36. 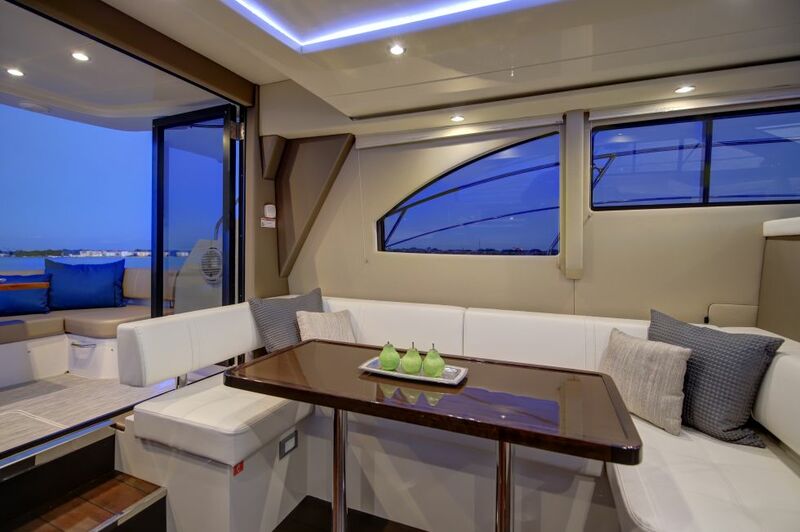 Hull, Deck and Superstructure: Hand-laid structural and non-structural fiberglass and core laminates bonded with infused resin. Hull bottom: Surface beneath the water line is sand blasted to create an optimal bonding surface for the anti-fouling paint. 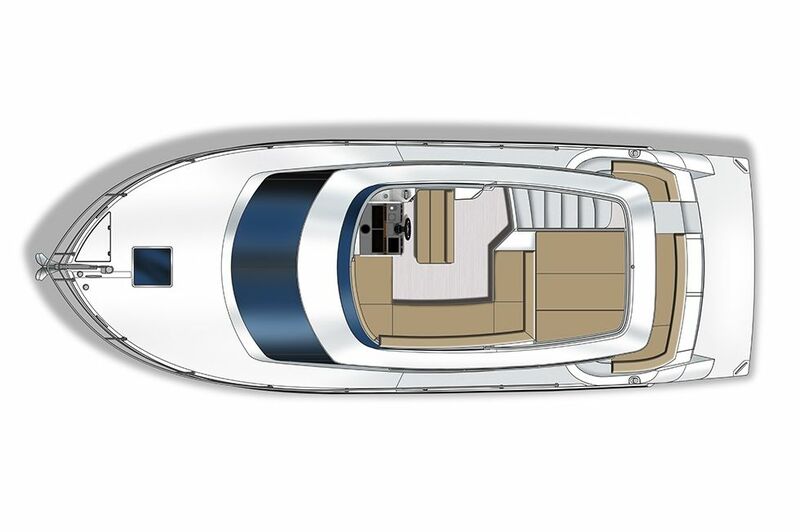 Sea Hawk® brand anti-fouling paint is sprayed onto the hull to create a smooth running bottom. 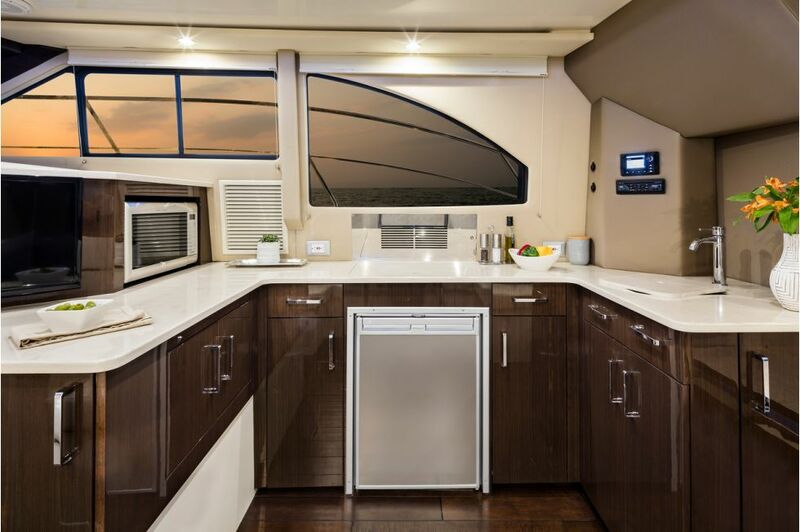 Interior bulkheads, cabinets and drawers precision cut, hand crafted cabinets constructed from a selection of woods and high pressure laminates. Drawers are lined with laminate. Integral aluminum truss reinforcement in cabintop structure. Engines: Twin Mercury 6.2 L 350 HP inboard engines with direct coupled v-drives. Each engine’s exhaust is routed to a Hydralift muffler and underwater exhaust port. Shafts and Shaft Logs: Aquamet® 1.5in (3.8 cm) diameter stainless steel propeller shafts. 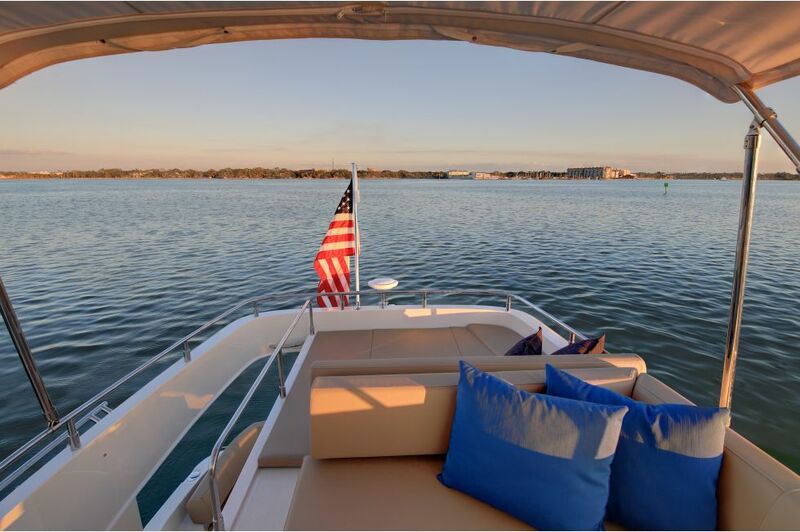 Tides Marine® SureSeal shaft logs are self-aligning, dripless and maintenance free. Sacrificial anodes are installed on each shaft. Propellers: 20in (51 cm), four blade, Nibral propellers. Fuel Tanks: Twin, 5052 aluminum tanks hold 125 gal. (473 L) of fuel each. Port and starboard fuel fill deck fittings. 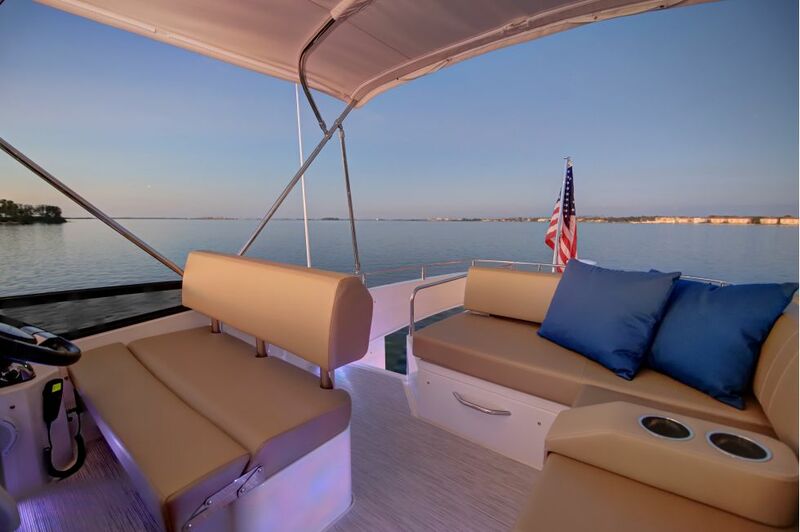 Rails: 1in (2.5 cm) 316 stainless steel rails are used throughout the vessel. Rail stanchion bases are secured using aluminum backing plates laminated into the deck’s fiberglass layup. Mooring Cleats: 10" (25 cm) mooring cleats are used at the bow stern and amidship (total of seven cleats). Cleats are secured using aluminum backing plated fused into the vessel’s laminate. Air Deflector: Plexiglass wind deflector is installed on the leading edge of the command bridge. Courtesy Lights: Three recessed 12V courtesy lights are installed on the C34 command bridge. Seating: Adjustable helm chair. Wraparound seating with table storage under wraparound seat cushions. Aft sun pad. 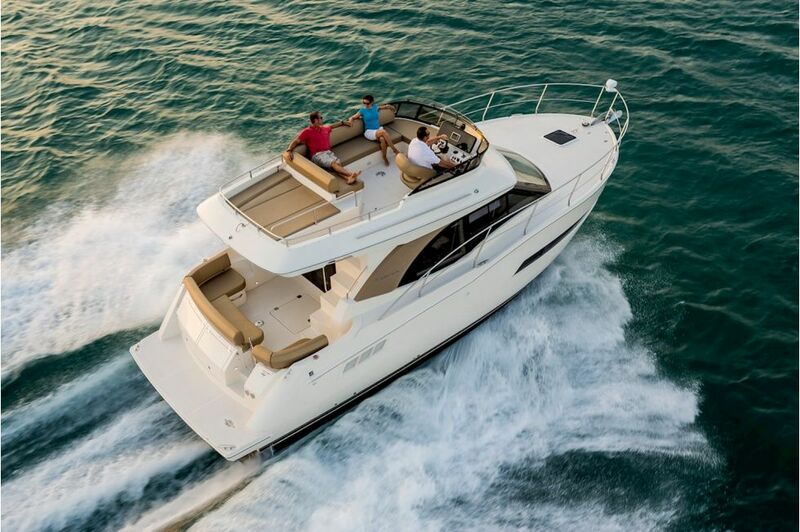 Entertainment: 24in LCD Television, Blu-Ray DVD player, AM/FM/CD marine quality stereo with speakers. Lighting: Eight LED lights are recessed into the salon head liner. Controlled by a rocker switch. 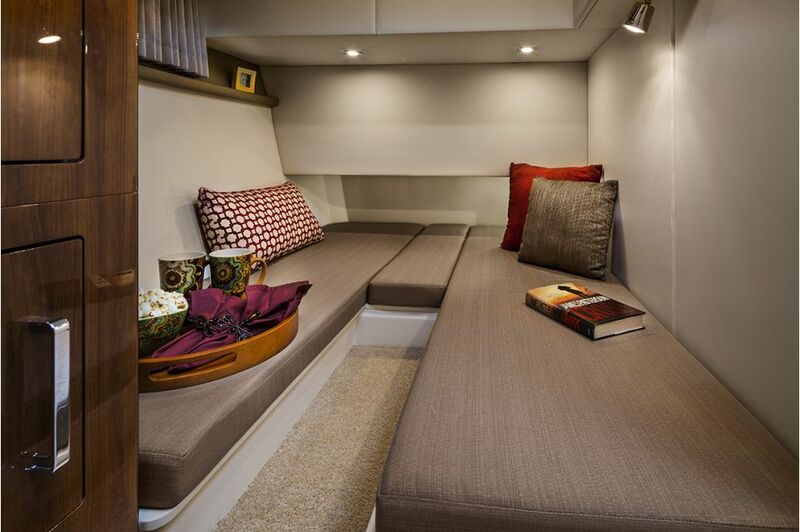 Seating: U-shaped upholstered lounge with storage underneath seating. Dining height table. Storage: Hinged door on salon floor provides access to storage compartment. Flooring: Plush pile 100% nylon carpeting throughout salon. 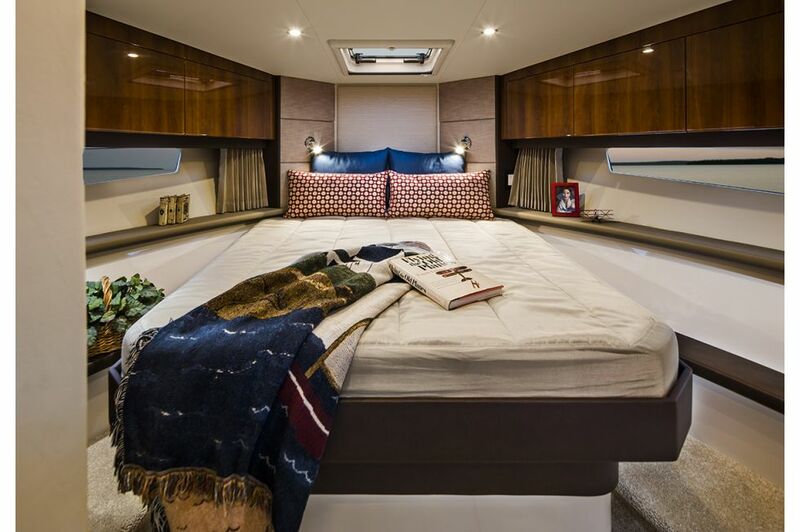 Sleeping: Queen size, island berth with Comfort Foam mattress. Dual end tables and halogen sconce style reading lights. Ventilation: Opening overhead hatch with screen. 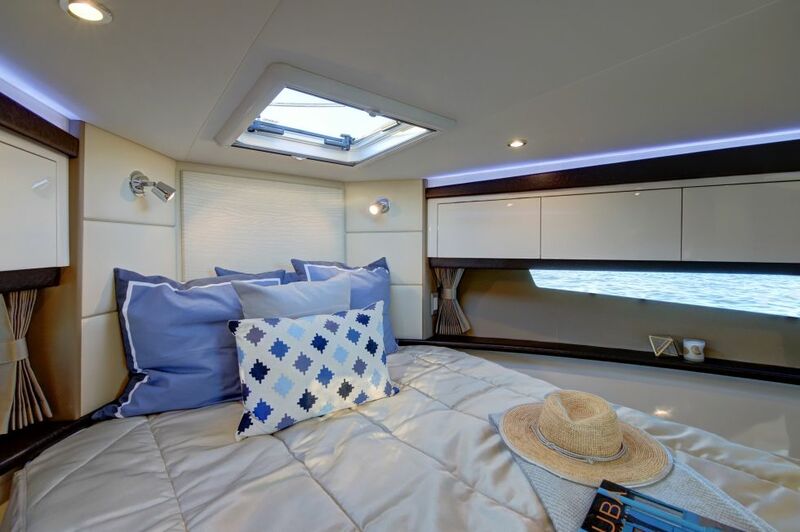 Lighting: Natural light provided by overhead hatch and hull windows with blinds. Six overhead 12V lights recessed in the headliner and controlled by a rocker switch. Two sconce reading lights. Shower: Fiberglass stall shower with bench seat and hinged aluminum and acrylic door. Shower head can be used as a hand shower. Sump drain with automatic pump. Exhaust fan. LED overhead light. Molded non-skid floor. 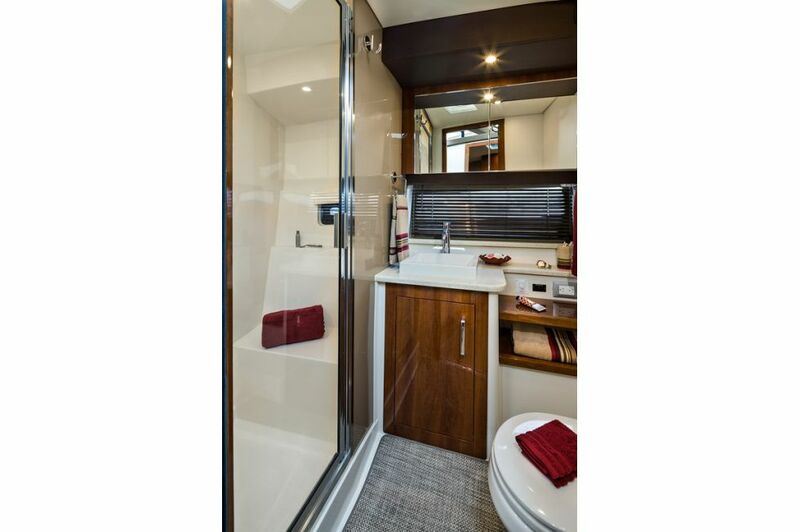 Vanity: Vanity is equipped with vessel sink, under sink storage, solid surface counter top, mirrored medicine cabinet. Lighting: Two LED lights recessed in the headliner and controlled by wall mounted rocker switch. 12V System: Powered by an array of Series 31 12V batteries. Array includes two dedicated engine starting batteries and one dedicated “house” battery. Battery banks are charged by a 60 amp charger for each bank. System ammeters are located on the ship’s 12V distribution panel and voltmeters at the helm station. Battery on/off switch for the house battery is installed in the salon and the selector switch for engine batteries is located in the engine compartment. 110V System: System consists of a 30 amp service supported by Marinco® 50ft (15.2 m) shore power cord. Ground fault circuit interrupters are incorporated into the onboard system. 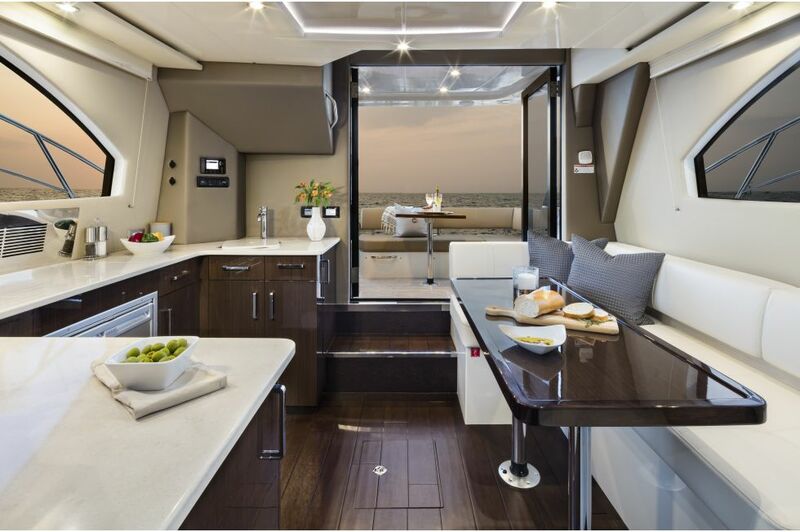 Television: Cable television is supported by onboard inlets in the salon and master stateroom and a 50ft (15.2 m) cable to connect to shore outlet. Fresh Water System: One 90 gal. (341 L) polyethylene tank with shore water connection and integrated pressure reduction valve. Fresh water fill fitting installed on walkway. Six gal. (23 L) water heater installed in engine compartment. On demand fresh water is delivered via a fresh water pump installed in the engine compartment. An on-demand sump pump is utilized for the shower. Holding Tank System: Forty gal. (151L) polyethylene tank is utilized with a dockside pump out fitting on walkway of vessel. Bilge Pumps: Two 1,500 gal. 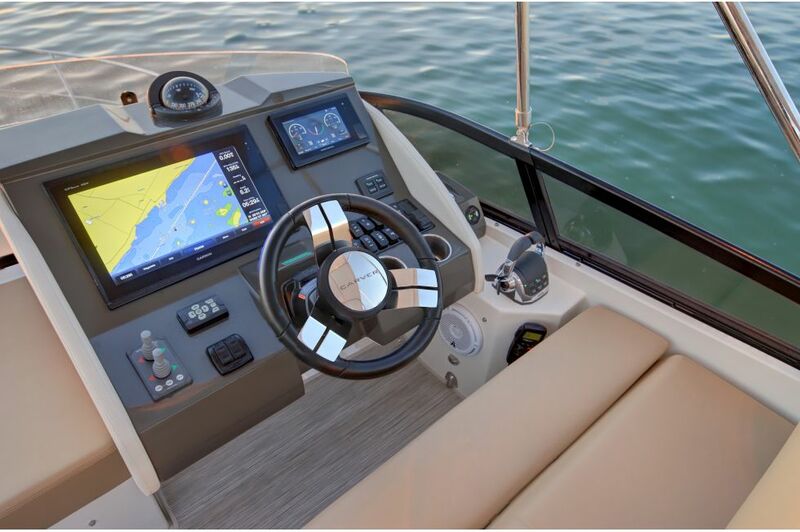 (5678 L) per hour automatic bilge pumps are installed, each with a manual on/off switch at the helm. A float switchfor the high bilge water alarm is installed in the engine compartment. Fire Suppression System: An FE241 Fireboy® automatic fire suppression system is installed in the C34’s engine compartment. 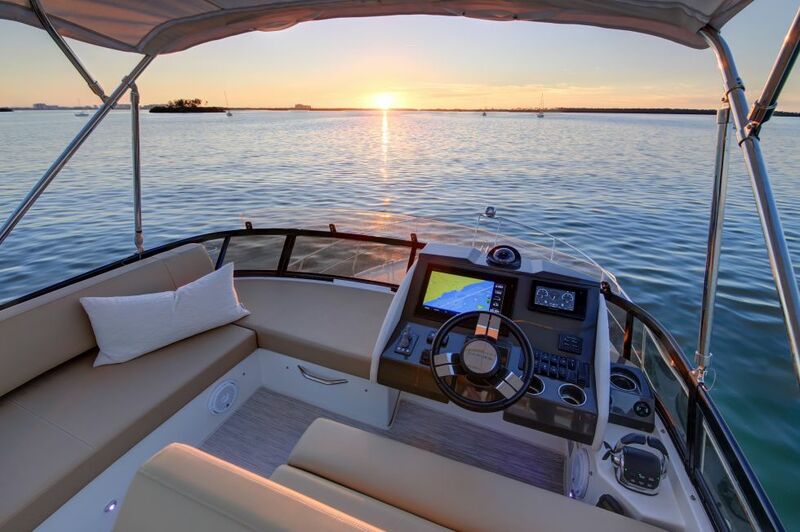 Compass: 4.5in flush mount illuminated Richie® Navigator compass is mounted at the helm. 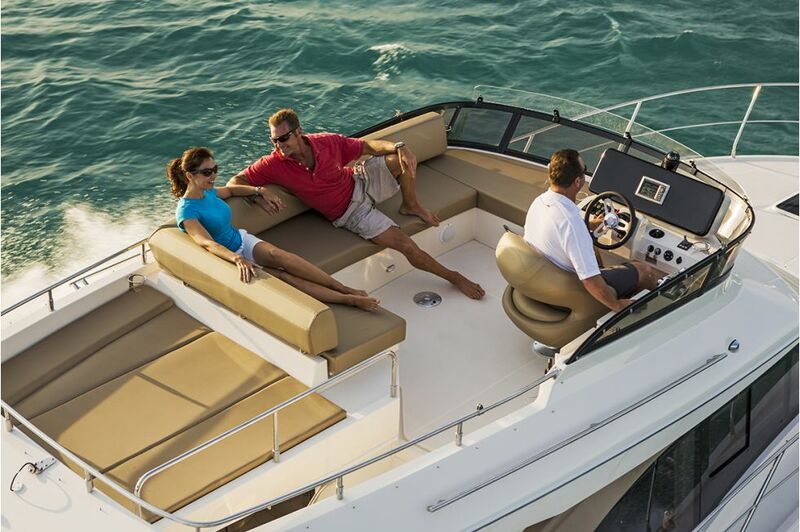 Seacocks: Marine grade bronze seacocks are used on all below the waterline thru hulls. Nylon fittings are used on above the waterline outlets. Storage: Storage locker below the bottom step to the command bridge. Appliances: Dometic® 3.8 CF (14.3 l) refrigerator, microwave over, two burner electric cooktop. 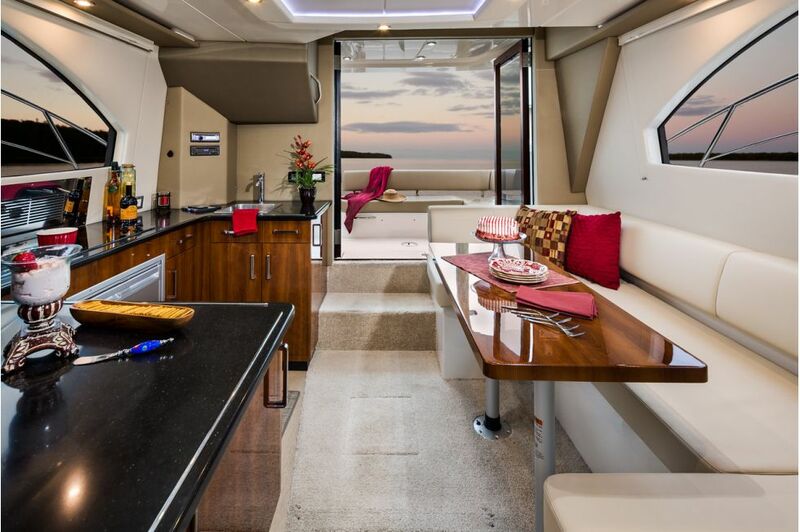 Lighting: Five recessed LED lights over galley counter controlled by rocker light switch. 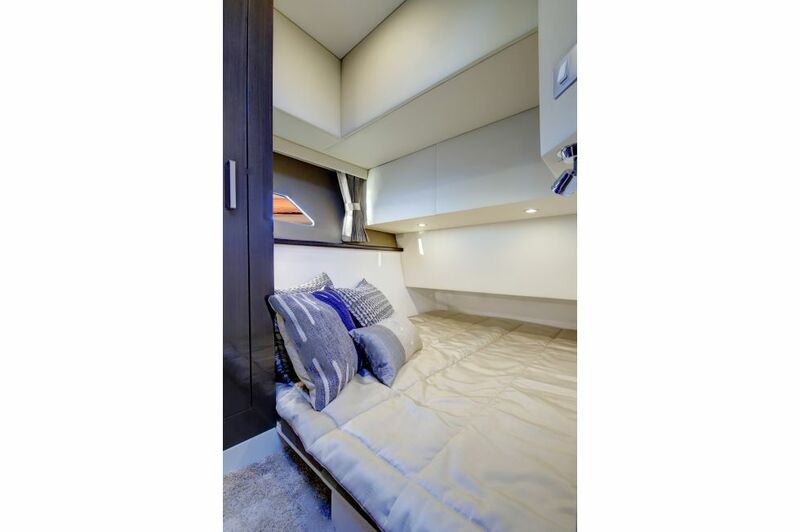 Sleeping: Twin berths with Comfort Foam mattresses. Lighting: Illumination is provided by three recessed overhead LED lights controlled by a rocker switch. Two bedside reading lights. Natural light provided by hull portlight.